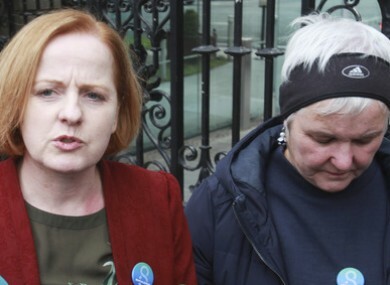 Ruth Coppinger and Brid Smith of Solidarity-PBP. TDS HAVE VOTED overwhelmingly in favour of making it compulsory for the Dáil to stand during the prayer, after some debate that the prayer should be scrapped altogether. The prayer, which is said at the beginning of each day’s business in the Dáil, will also have a 30-second silence added after it. Some TDs have been campaigning to have it removed and replaced with something non-religious, but three amendments that would have removed the prayer were voted down. While it had been customary for everyone in the chamber to stand during the prayer, it was never included in Standing Orders (the Dáil rules). Direct, we beseech Thee, O Lord, our actions by Thy holy inspirations and carry them on by Thy gracious assistance; that every word and work of ours may always begin from Thee, and by Thee be happily ended; through Christ Our Lord. Amen. When the reading of the prayer is concluded, members will remain standing for the 30 seconds of reflection. A number of amendments were put down today. Sinn Féin’s amendment wanted to scrap prayer and have “60 seconds of silent reflection”. This was defeated by 94 votes to 41. Solidarity-PBP’s amendment to get rid of the prayer and have no prelude whatsoever was defeated by 96 to 15. Left-wing Independent TD Joan Collins’ amendment to replace the prayer with 30 seconds of silence and no prayer was defeated 96 votes to 19. The final motion was passed by a majority of 97 votes to 17, with 19 abstentions. Email “TDs have voted to make it compulsory to stand during the Dáil prayer”. Feedback on “TDs have voted to make it compulsory to stand during the Dáil prayer”.